Beer With Easter Lunch? Believe Us … It Works! If you find firm resistance to the suggestion of pairing beer rather than wine at the upcoming Family Easter Dinner, then here’s a few reasons to think again! It may not be referred to as the most ‘obvious’ partner but beer marries very well with most Easter fare – here’s 5 to try! You can’t get a more beer-friendly protein than Chicken, and Roast Chicken is perfect for Easter lunch as we head into a cooler April climate. We recommend a Hefeweizen which is a well-known German wheat style beer. Not as dry as pilsner it has very little bitterness. For a mouthful of refreshing and citrus styled Hefeweizen, try the 4 pines option – a cloudy pale beer with a straw-like appearance, with aromas of banana and spice on the palate. Another beer-happy poultry piece is Roast Turkey (particularly good with wild cranberry sauce) which often sings happily on the palate with any type of golden ale or lager, but our top tip is to pair with a blonde ale. Try Leffe Blonde, a Belgian Ale with delicate and distinctive aromas of caramel and toffee. 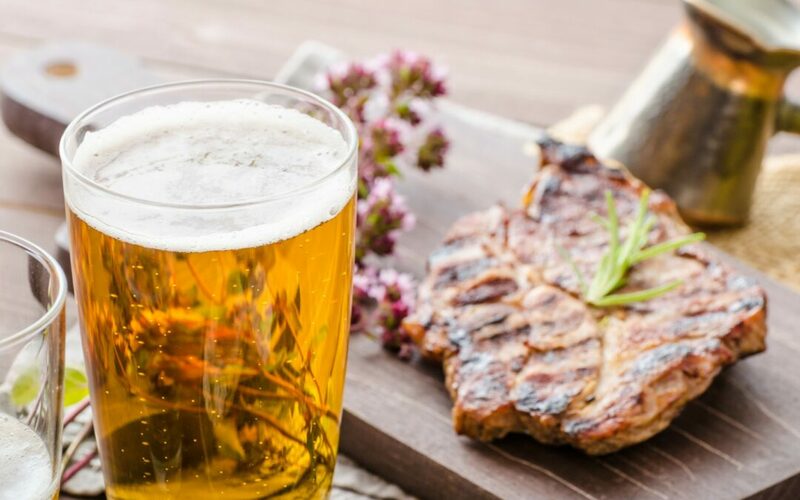 Strong flavours tend to overwhelm light beers, and Roast lamb is a strong and hearty Easter dinner, that’s why its recommended to pair with a complex, slightly heavier brew to accompany it. Try with Sierra Nevada Pale Ale, it has a deep amber colour and is exceptionally full-bodied, complex character to compliment the lamb. If you prefer to keep Easter a vegetarian offering then it’s often best to pair beers that are light, citrus-filled wheat beers as it tends to cut through any richness of a strong dressing. Hoegaarden is intensely aromatic and filled with lemony fruit spices with just a hint of chocolate. This is fruit, fresh, easy-drinking at its best! How ever you spend Easter we are sure there will be plenty of chocolate on the menu! Chocolate, it may surprise you to know, goes exceedingly well with beer, particularly fruit flavoured beer. To top of dinner and dessert, our top recommendation is to try Wilde Gluten Free Raspberry Beer with its delightful pink hue and raspberry aroma, it offers a fruity balance to the bitterness of the hops. This pale ale is a wonderful match for all that the Easter bunny brings! As a rule of thumb similarities in food often pair well with properties of beer (much like wine). Light coloured beers compliment lighter foods and canapes, while heavier beers are best paired with more complex and robust flavoured foods.